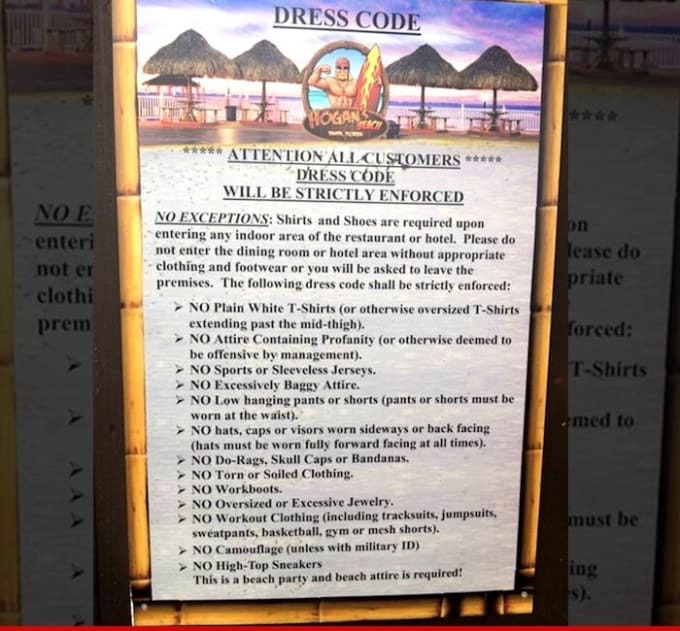 Hulk Hogan’s Tampa restaurant, appropriately named Hogan’s Beach, might be a great spot for burgers and beers, but don’t think about going there if you wear caps, camo, durags or anything else remotely hip-hop. TMZ spoke with an employee at the restaurant who, when confronted about the oversized jewelry ban said, “I don&apos;t want to sound stereotypical ...” before trailing off. Wow. They also reached out to Hogan, who claimed that he didn’t know anything about the dress code and was looking into it. Your move, Hulk. Here&apos;s your chance to be a real American hero.